On Tuesday, the SC Environmental Law Project filed a federal lawsuit in the Charleston District on behalf of the SC Small Business Chamber of Commerce and 16 SC coastal cities (Charleston, Mount Pleasant, Isle of Palms, Folly Beach, Edisto Island, Seabrook Island, Kiawah Island, James Island, Beaufort, Hilton Head Island, Bluffton, Port Royal, Awendaw, Pawleys Island, Briarcliffe Acres and North Myrtle Beach). The complaint states that the National Marine Fisheries Service (an agency within the U.S. Dept. of Commerce), failed to follow the law when it issued Incidental Harassment Authorizations (IHAs) supposedly to mitigate the harassment, injury and even killing of marine mammals from seismic airgun blasting the Trump Administration wants to approve for exploring for offshore oil in the Atlantic. Specifically, the complaint cites that the NMFS did not conduct an environmental impact statement that would include the assessment of the economic impact seismic testing would have on businesses, local economies and local government. The plaintiffs maintain that seismic testing would negatively impact the commercial fishing industry (from commercial fishermen to the retailers) by reducing fresh catch by up to 80% due to the intense and constant airgun blasts. Sport and recreational fishing would also be harmed. Concern is also raised that seismic airgun blasting could possibly release toxic chemicals from deteriorating canisters of conventional and chemical munitions and drums of radioactive waste that have been dumped along the Atlantic Coast, including South Carolina’s, for decades. The sudden release of these toxic chemicals could get into the food chain, harm marine mammals and possibly wash ashore and threaten humans. 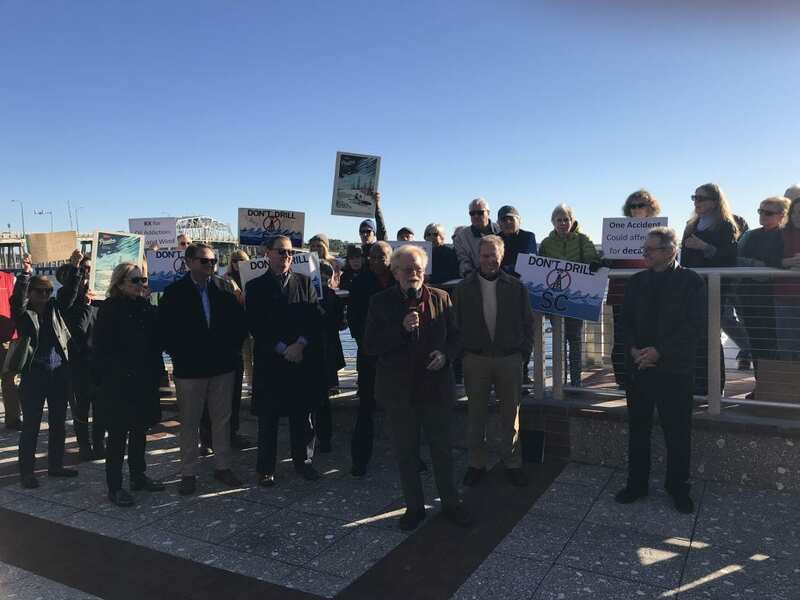 Below are the news stories from the press conference held in Beaufort by the Small Business Chamber and Lowcountry cities with 40 supporters attending. A second lawsuit was also filed by conservation groups including some from South Carolina.